Sharad Sharma, governing council member of iSpirt, offered an apology and said he would be investigated by a compliance committee. 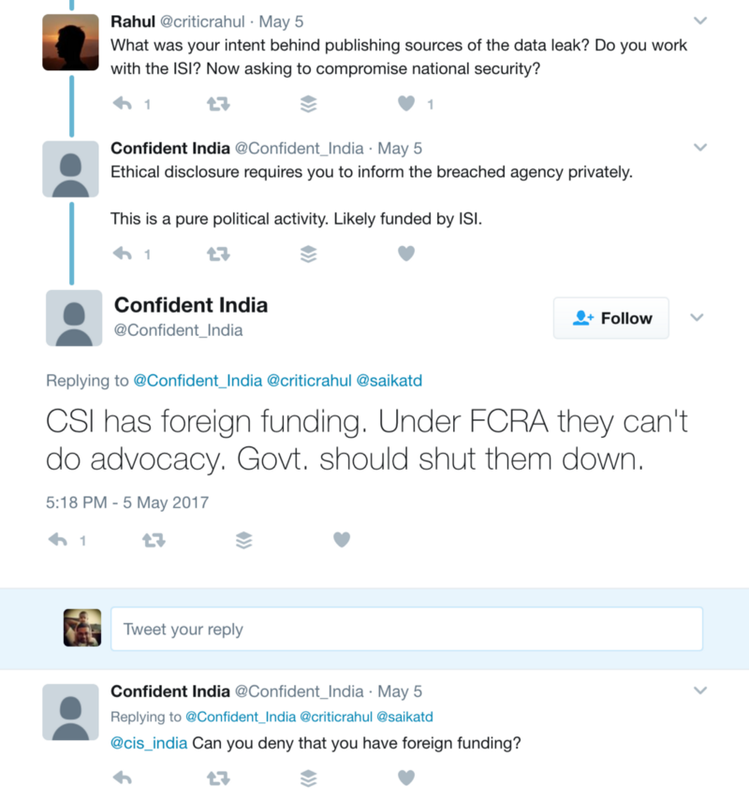 A co-founder of iSpirt, a private non-governmental organisation closely associated with the Aadhaar-administering Unique Identification Authority of India, has admitted to anonymously trolling critics of the Aadhaar project on Twitter. 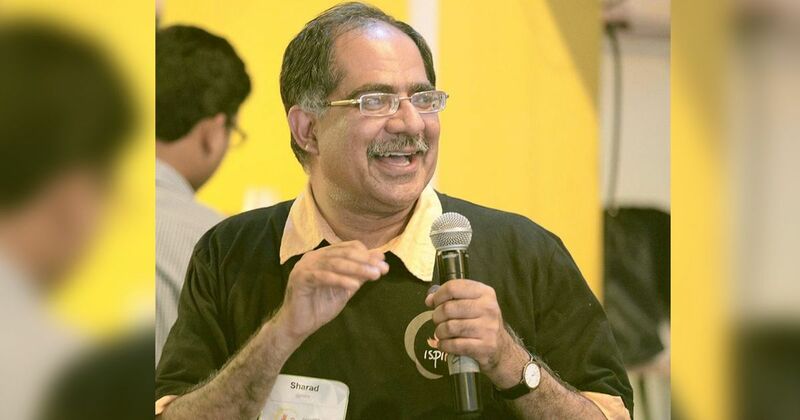 In a tweet on Tuesday, iSpirt governing council member Sharad Sharma said he had “slipped”, offered an apology for his behaviour and announced that the organisation had set up a committee to investigate his actions. The admission of anonymous trolls harassing Aadhaar critics – suggesting that they were likely to be in the pay of Pakistan’s ISI intelligence agency, for instance – comes just days after the UIDAI officially complained about researchers who had pointed to holes in the security standards of the Aadhaar project. Taken together, this suggests an environment where anyone questioning the government’s biometrically linked identity number programme is likely to be subject to both official and anonymous attacks. iSpirt, or the Indian Software Product Industry Roundtable, was constituted in 2013 as an offshoot of industry body NASSCOM’s annual product conclave. It was built by donors, volunteers and partners from the Indian tech industry, and included former UIDAI chairman Nandan Nilekani as a mentor. 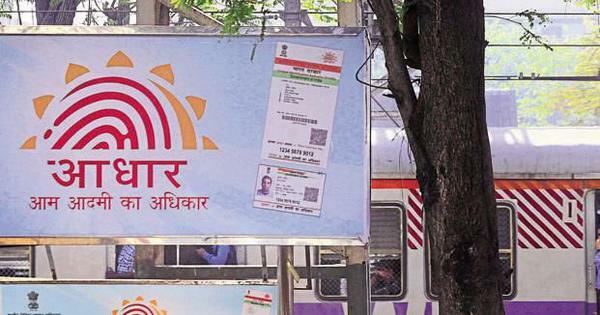 It also featured at least two key members of the team that worked at UIDAI: Pramod Varma, who was the Chief Technology Architect of Aadhaar, and Sanjay Jain, its Chief Product Manager. The organisation helped build India Stack, a set of software products that are explicitly aimed at building apps on top of the Aadhaar database. India Stack builds Aadhaar-based apps and then “evangelises” them to the government – which Medianama’s Nikhil Pahwa points out is uncomfortably close to them – as well as to private organisations. Sharma’s admission is a reference to allegations first made by Internet Freedom Foundation co-founder Kiran Jonnalagadda. Jonnalagadda had pointed out that earlier in the month a number of anonymous accounts had started harrassing him and others who had questioned Aadhaar, the Indian government’s programme to provide a 12-digit unique identity to more than 120 crore residents which is under challenge in the Supreme Court over privacy concerns. The tweets swung from arguing that Jonnalagadda was being a hypocrite to going as far as alleging that a research organisation critiquing Aadhaar’s implementation was funded by Pakistan. Jonnalagadda examined some of the tweets and concluded, in a blog post, that at least one of the accounts was being run by iSpirt’s Sharad Sharma, who is quite well known within India’s tech industry. 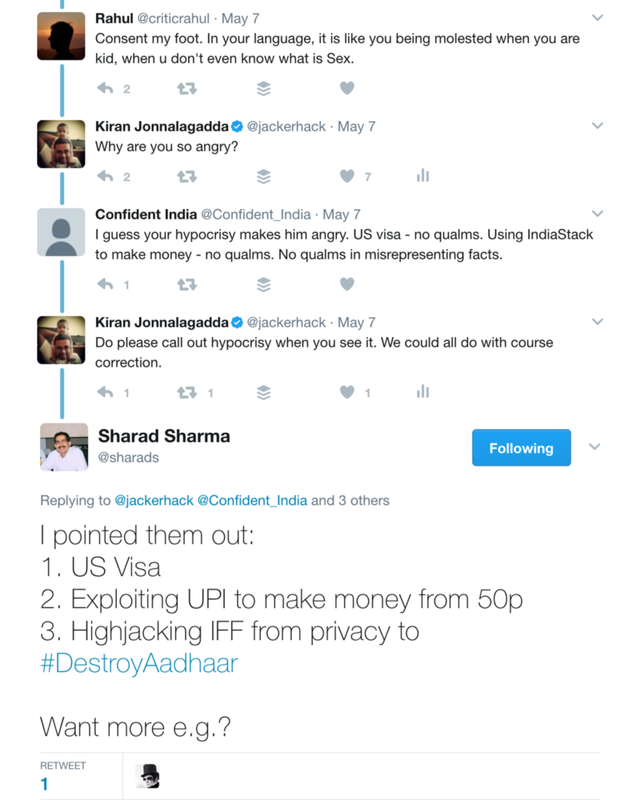 Speaking to the technology news website FactorDaily soon after, Sharma categorically denied that he was behind the “Confident_India” Twitter account and said that it was “some kind of silly frameup”. Following this denial, Jonnalagadda added more details to his blogpost, including a leaked iSpirt presentation that referenced the organisation’s plan for handling criticism. One of the slides mentioned a group of iSpirt volunteers referred to as “swordsmen” who were placed under the category of “informed but trolling”, which Jonnalagadda took as further evidence that the organisation was involved in anonymous trolling. Again, iSpirt denied these allegations, saying that Jonnalagadda was misreading the leaked slide. Sharma’s post says iSpirt’s governing council has set up a committee to investigate the issue and recommend a revision of the code of ethics and corrective actions. “They’ll decide and I will abide by their decision,” he added. Sharma’s admission that he had been trolling critics received praise from Nandan Nilekani, the architect of the Aadhaar project, who said he would certainly take iSpirt to greater heights.